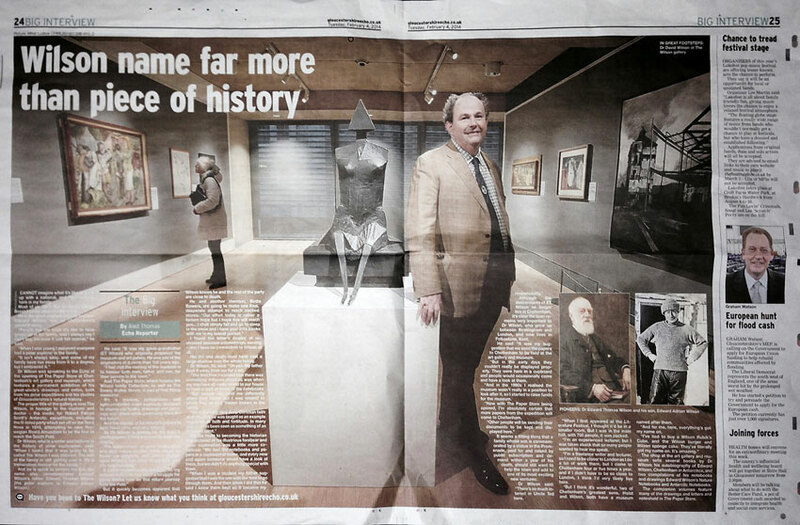 The Cheltenham Art Gallery and Museum has recently undergone a major refurbishment. After widespread public consultation the new museum was renamed “The Wilson” in honour of the Wilsons of Cheltenham and Edward Wilson of the Antarctic in particular. Demands for a Museum to be named in Cheltenham in honour of Dr Edward Wilson of the Antarctic started shortly after his death with letters appearing in the local press. One hundred years later, after a public vote and a unanimous decision by Councillors, the existing Cheltenham Art Gallery and Museum was finally renamed The Wilson. This means that Cheltenham now has two major museums, each named for one of its most famous sons, The Holst Museum and The Wilson. In fact, the Museum owes a good deal to the Wilson family – of which Edward Wilson of the Antarctic (1872-1912) is simply its most famous member. The Museum itself was only founded and opened due to the dedication of Dr Edward Thomas Wilson of Cheltenham (1832-1918), the father of Edward Wilson of the Antarctic. It was he who opened the original Museum and Art Gallery on 20 June 1907. Dr Edward Thomas Wilson of Cheltenham was a major pioneer of the Victorian town. As well as being a medical pioneer, founding the Delancey Hospital, championing clean drinking water and District Nurses, he promoted a huge number of interests spanning both the Arts and Sciences. He was involved in numerous clubs and societies, and founded the local photographic society – the seventh oldest in the country. He also campaigned to establish a free library, a museum and an art school for the town. His achievements in public health, photography (as a pioneer of photomicrography) and the natural sciences, were recognised far beyond the confines of Cheltenham, both at national and international levels. 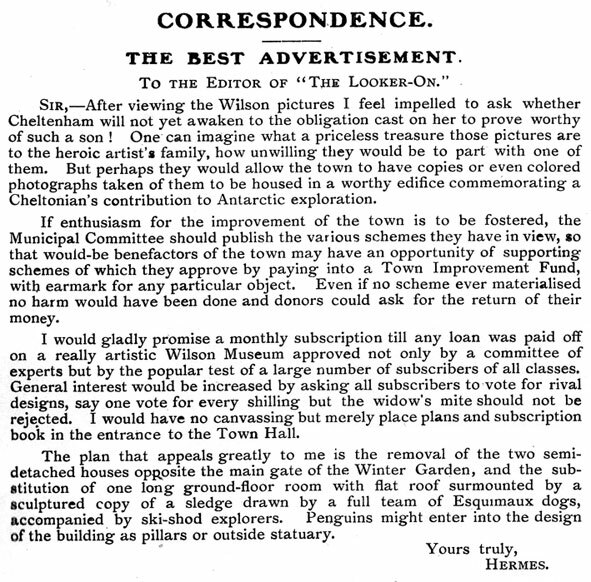 In October 1891 he spoke in support of a museum for Cheltenham but the proposal did not attract sufficient support. He tried again in November 1906 which helped to start the process that eventually led to the opening of the town’s museum on 20 June 1907. Wilson proclaimed the museum open in front of a goodly company, representative of the scientific, literary, artistic, and municipal life of the town in June 1907. Cheltenham’s famous M.P., and Mayor Baron de Ferrieres, whose donations of art and finance had made the project possible, commented on the day, that it should be Wilson who is considered to be the originator of the Museum, for while many of those in authority had not been very keen for it, his persistency had kept them up to the mark. The Wilson family has supported the Museum ever since. Five generations of the family have now actively supported the Museum, often with major donations of material. Dr Edward Thomas Wilson himself, his daughter Ida Wilson and son Lt. Col. Bernard Wilson DSO; daughter-in-law (and widow of Edward Wilson of the Antarctic) Oriana; grandson Rev Dr Major J. Michael Wilson and many of his great grandchildren, led by Dr David Wilson have delivered over a century of public service to Cheltenham through the Museum. It was for these reasons, as well as for one of the Town’s most famous sons, that the Councillors considered The Wilson to be an appropriate new name for the Cheltenham Museum. and returned again a few months later on 30 January 2014 to open the new Paper Store, which forms the main part of the Open Archive in the new development. This gives unprecedented public access to several important archival collections at the Museum, including the Wilson Family Archive. The completed new wing of the Wilson was given a formal opening and royal blessing on 30th May 2014 when their Royal Highnesses the Duke and Duchess of Gloucester officially opened it, after touring the Museum and talking to assembled guests. They were presented with a reproduction Antarctic watercolour by Dr Edward Wilson as a token of rememberance.